There’s an adage in Washington State fishery politics that the recreational fishermen are too disorganized and too idle to get much accomplished in Olympia. There are seven hundred thousand (700,000!) license buyers annually in the state, and we continue to be undervalued economically and socially in the political calculus. It’s time for a change–and we’d propose a new strategy–fighting back. It’s time to throw an elbow–and do so in a highly visible way–by working together to remove a problematic legislator from office. Recreational fishers are a state-wide constituency, but our representation is similarly distributed. Perhaps our mistake has been to be unfocused when it comes to elections–something we hope to change starting now. If we succeed at focusing our collective energy on the defeat of a single state legislator, we’ll not only increase our odds for success, we’ll also clearly demonstrate for other legislators why they need to speak to our issues. So, after consulting with experts in both state politics and on fisheries–we’ve concluded that for this cycle we’re going to focus on the Washington 32rd district–which covers Edmonds, Lynnwood, Shoreline, and North Seattle. Currently Democrat Marilyn Chase holds this seat, and she’s been a consistent opponent of recreational fishing. 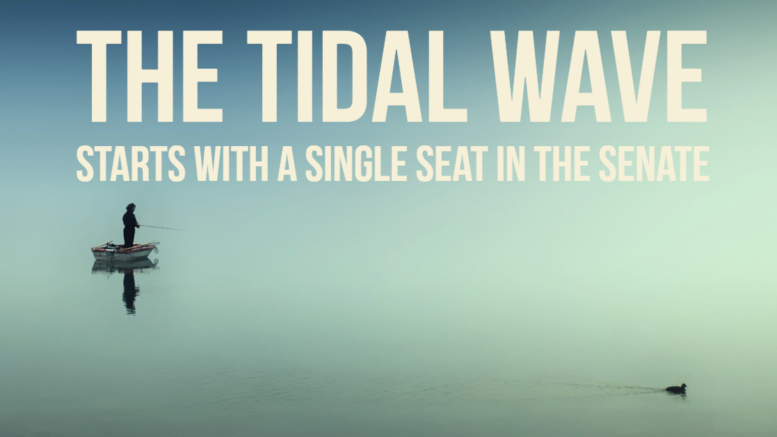 We think it’s time for a Tidal Wave–time for her to go. Forward this recommendation (or his endorsement/website links below) along to any/all of your friends you have who live in Edmonds, Lynnwood and Shoreline areas. They don’t need to be fishermen — as you will see below Jesse Salomon is a widely endorsed, highly qualified candidate! Sign up to stay informed at the “Help Out” form at the top of our side-bar on the right! We’ll keep you posted on this effort, as well future efforts focused along this very same approach. This is entirely non-partisan (see below) and will remain focused on the defeat of politicians who obstruct recreational fisheries. Go Vote yourself before the August 7th deadline–regardless of which district you’re in. You probably have the ballot on your desk right now! Appointed to her senate seat in 2011, Senator Chase almost immediately demonstrated animosity towards recreational fishing in favor of reflexive support of commercial interests. There are plenty of examples of this: She drafted and signed a 2011 letter to WDFW stating, falsely we might add, that recreational fishing economic activity “pales next to” the significance of commercial fishing. This is incorrect viewed both for Washington State fisheries overall, and on a per-fish basis. She’s just flat wrong. Compounding her flawed analysis, she later gave comments opposing SB 5844 — a bill to promote and prioritize recreational fishing. At this hearing she advanced an entirely new, and once again fictional economic theory that tries to distinguish between dollars earned by “basic industries which grow our economy (commercial fishing) and those industries which cause economic churn (recreational fishing)”. Her nonsense continued as she tried to claim that recreational fishing dollars are somehow even less valuable because people have fun fishing. You may think we’re exaggerating, but you can’t make this stuff up, a link to the video is here. Of late, she’s been tirelessly trying to force changes in the composition of the fish and wildlife commission at the behest of commercial fishing interests. She’s introduced bills attempting to legislate commercial fishing membership on the commission. It’s our position that politicians (both legislative and executive branch) are best kept well away from the commission–and there is plenty of oversight in the nomination and confirmation process already. Of course this fits her pattern — relentless support of commercial fishing interests. What we’re looking for is change, Senator Chase. It’s time to go. Why Jesse Salomon? Why not James Wood? There are two candidates running against Senator Chase in the primary–Democrat Jesse Salomon and Republican James Wood. Since we’re looking for someone to unseat Senator Chase, we need a candidate to defeat her in the November general election. The history of the 32nd district is roughly D+20 which means a Republican needs to overcome a 20% structural disadvantage to win here. While James Wood seems a fine candidate, he’s a Republican running in a solidly Democrat district — we just don’t believe he can overcome this big of an obstacle in the general election. Which brings us to Jesse Salomon — a Democrat making a primary challenge to Senator Chase. Salomon brings plenty of experience (Shoreline city council, deputy mayor, child welfare prosecutor, and King County public defenders office) and he’s managed to secure the endorsements of both the Everett Herald and Seattle Times. On top of all that he is an avid recreational fisherman. Leaders of sportsfishing groups have come away from meetings with Salomon highly impressed. In short, we think we finally have an excellent candidate who can win the general election and unseat Senator Chase. Here’s his website link if you’d like to learn more about him. The very best thing you can do for recreational fishing–regardless of your political leanings–is to vote, and get your friends to vote, for Jesse Salomon in the August 7th primary. He’s qualified, he’s endorsed by the major papers, and unlike Senator Chase he’s not in the pocket of commercial fishing interests. Reach out to your friends in Edmonds, Shoreline, Lynnwood, and North Seattle and spread the word! 8 Comments on "Tidal Wave | Fighting Back for Recreational Fisheries"
Having more of a recreational fishing season isn’t going to really solve the issues regarding our current situation…..unregulated tribal commercial fisheries need to be regulated and monitored by the WDFW and the Federal government. These practices have been used for decades now and are destroying all of our salmon runs, halibut and bottom fish, and shellfish numbers, We need to put our collective efforts into holding the people accountable for the outright neglect and misuse of such a valuable and enjoyed resource…..what about the Skagit and Samish river systems and the San Jaun Islands? these fisheries are being ruined at a break neck pace especially over the past five years. I agree we do need to get organized and fight for recreational fishing as I am an avid fisherman but more importantly we need to save a literally dying resource. More time and larger limits for all of the recreational fisherman is a great thing. Hundreds of thousands of us have been fishing for many years we know how good it used to be. Today it is outright unfair and disgusting what has been and being done to such an important part of the Great Northwest.The next generation of sportsman should have every opportunity to experience and enjoy what we have. Lets get together people and start making a difference I am more than ready! GMan, we share your enthusiasm in helping rebuild our once great fisheries. That said, we wouldn’t call tribal (both subsistence and commercial) fisheries unregulated and unmonitored. We’d like to see mutual monitoring by the co-managers to build trust — but it’s not reasonable to say there is no monitoring today. Like a lot of “big” problems, there’s not just one cause — but a large number of inter-related ones. We need a dozen small steps in a dozen distinct areas to get us there. Raising the profile of the enormous impact of recreational fisheries is an important item on that list! I recently met with Jesse Salomon. He’s an avid recreational fishermen, and couldn’t stop talking about his fishing and boat. On top of that, I first met Jesse in 2006 when he ran an impressive campaign to unseat a popular incumbent. Long-story short: Jesse will be receiving the full support of Northwest Marine Trade Association. Our industry would benefit from someone like Jesse in the state senate. It really is a shame that these anti-commercial fishing screwballs can’t add. They haven’t a clue about how many jobs the commercial fishing industry creates for the country state, county and the Shoerline district. Seattle is the home base for Trident Seafoods … https://www.tridentseafoods.com/ along with several other large and small fish companies that provide thousands of jobs, jobs, jobs. Johnnie, while we appreciate the post — we will do a deep dive into how commercial fishing really works in state. Since you challenge us to do the addition on the impacts of commercial fishing (vs. Recreational) and the jobs/economic impact — we’re going to do just that. Except unlike your broad brush, and most industry-sponsored analyses, we’re going to try to narrow down just the Washington State fisheries, and further separate out the commercial crabbing/groundfish from the rest. A little sunshine on this problem will reveal which side is being transparent about the real mathematics. We’ll do you one better, we’ll be running an update in the coming days! Well you need to study the facts. NOAA publishes all you need to compare the economic impact of the recreational fishing by region in this state to the commercial impact. You will also see the rec. totals are retail,2nd homes, bar tabs, every dime spent. The commercial side is simply ex vessel impact. The NOAA authors caution against using their data to compare the two fisheries. The bottom line is obvious, the commercial industry is huge compared to the rec.